WATERFRONT! Channel View Estate - Take your mind off the hustle and bustle and enjoy the privacy of the Channel View Estate! With views across San Juan Channel and then bordered on one side by Rocky Bay you will certainly get the unique feel and privacy of the island! 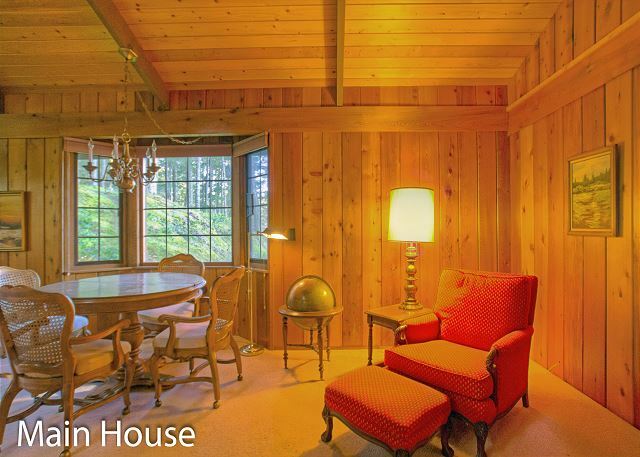 With 5 bedrooms and 4 bathrooms total the estate can comfortably accommodate groups up to 10. 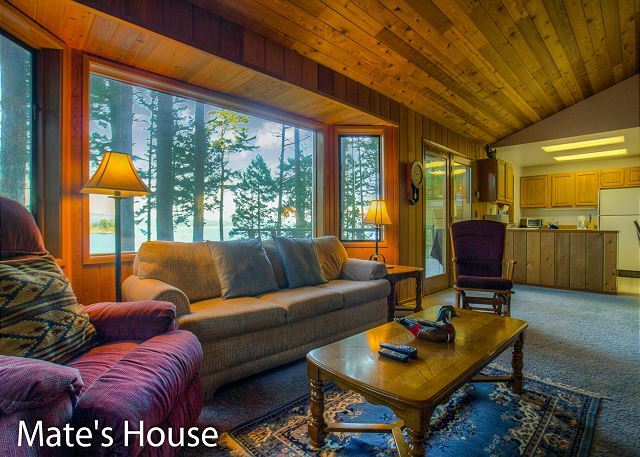 The 2 bedroom, 2 bathroom main house offers great water views from the living room with wood burning fireplace. 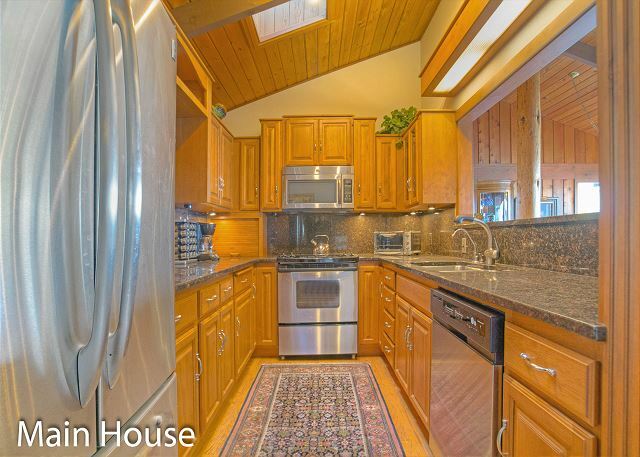 The galley style kitchen has granite countertops, stainless appliances, and is fully equipped. 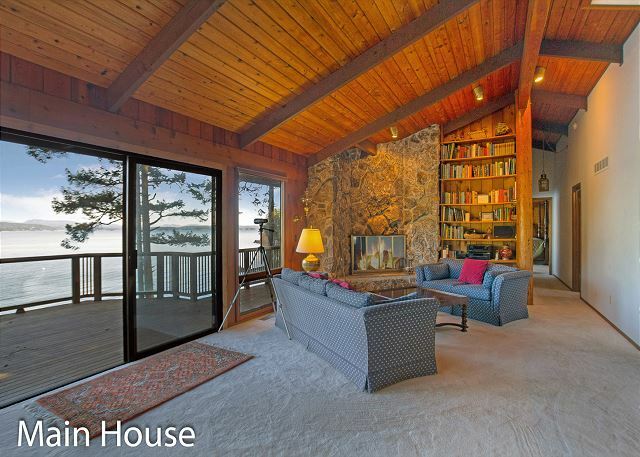 The family room has a wood stove and is the perfect spot to kick back and read a book. 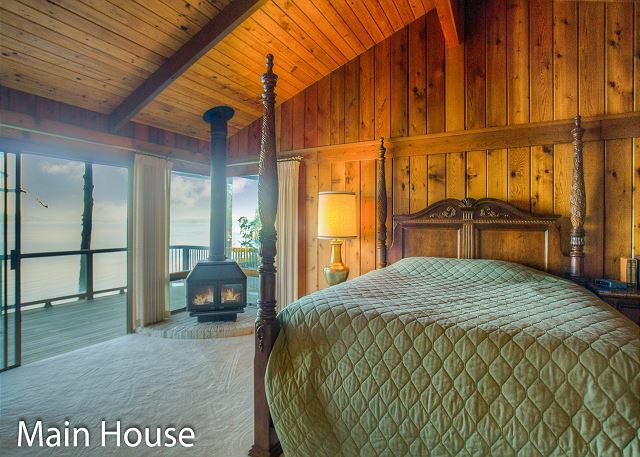 The waterside master suite is furnished with a king size bed and attached bathroom. 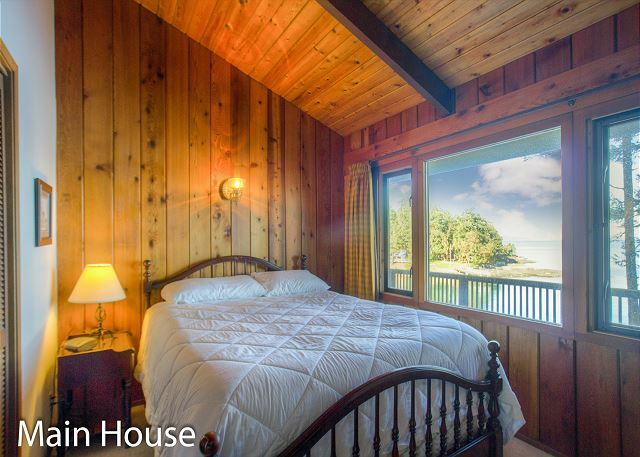 The second bedroom is also waterside, furnished with a queen size bed and is located across the hallway from a bathroom. The 3 bedroom, 2 bathroom guest house (Mates House) also has waterviews looking to the channel and Rocky Bay. 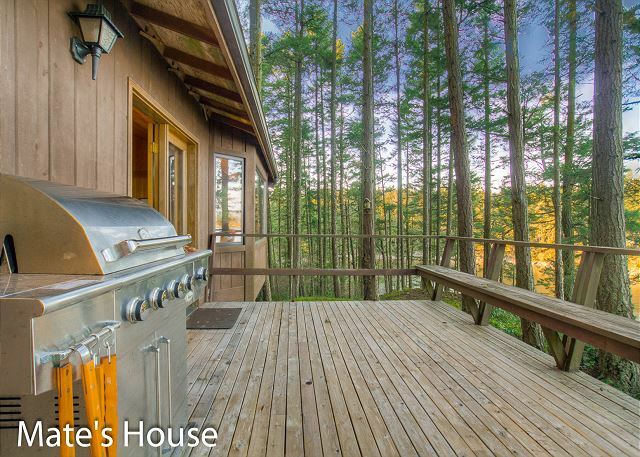 This open concept house has a woodstove in the primary living space which is open to the fully stocked kitchen. 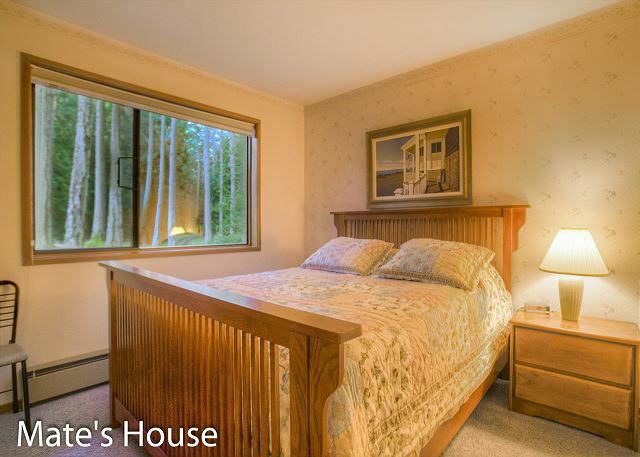 The master suite is furnished with a queen size bed and has an adjoining master bath. 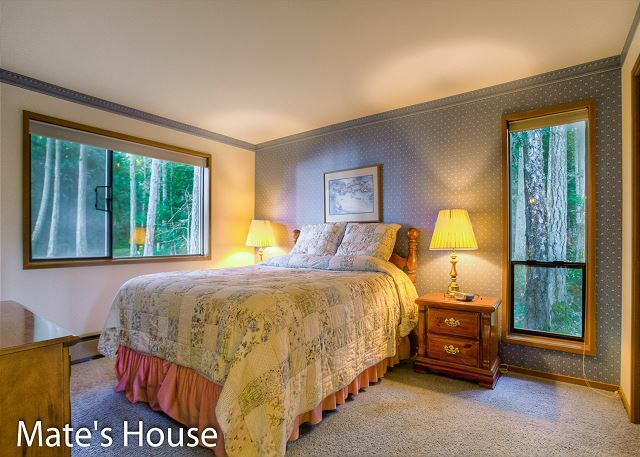 The second bedroom also has a queen sized bed and the third bedroom is furnished with a set of twin bunk beds. 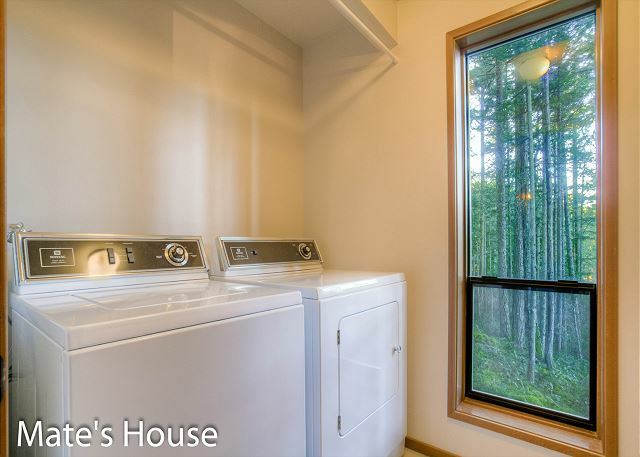 The guest house also has a full laundry room with washer and dryer available for guest use. 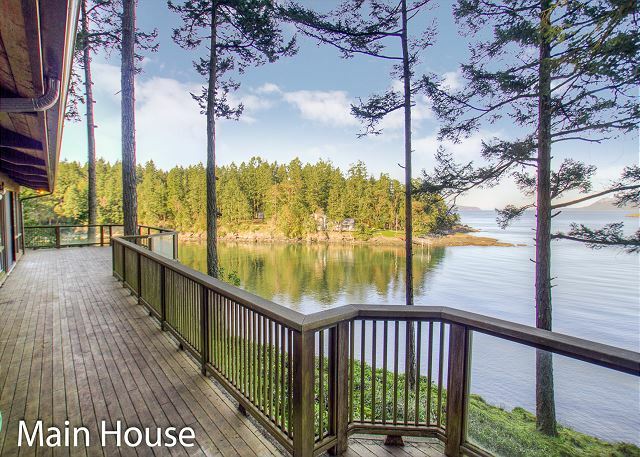 This estate offers end of road privacy yet is still centrally located between Friday Harbor and Roche Harbor. 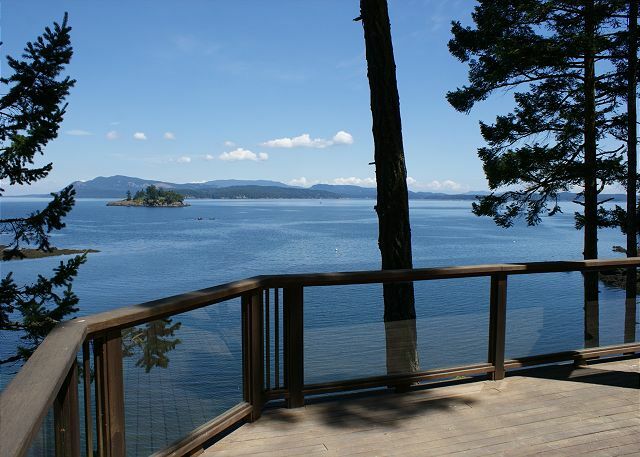 Enjoy the hiking trails at Mount Young or a game of Frisbee golf at the nearby Roche Harbor Frisbee Golf Course. Whatever your daily activities may be, the Channel View Estate is a great home base. This house has spotty cell phone reception. We had a super good time on San Juan Island. 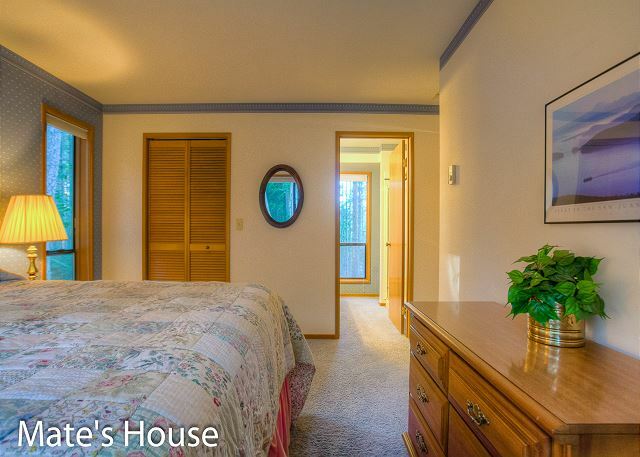 This property is great for big family/large groups. The views are spectacular. Home was clean and well stocked with helpful things like dish soap, laundry stufff etc. My extended family of 13 stayed here for a reunion. It was delightful. Spacious home and yard, quiet and off the beaten path location, peaceful and serene with plenty of deer and birds to watch. Amazing sunrise views. My only concern for someone considering this house is that there is very little water pressure in the extra houses. 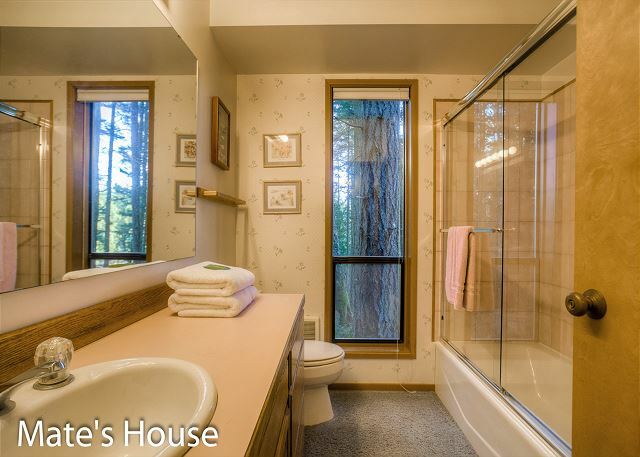 Plenty in the main house, however, so sometimes we showered there. Great place for our family vacation! Spent a week here in July with our three grown kids and their kids. Gathered mostly in the main house but it was good to be able to spread out for sleeping and alone time. All three houses well equipped and comfortable. Fantastic views. Enjoyed watching the eagle hunt from his fishing tree and then flying his catch to his “eating tree” on the other side of the bay.. Highly recommended. Just wonderful! The three houses were well appointed with beautiful views! We rented the property for my sons wedding that was on the island. We loved to space for our family. Great view very warm and cozy. Large space for family to eat together and hang out. Loved this place. Great for large groups, multiple families. 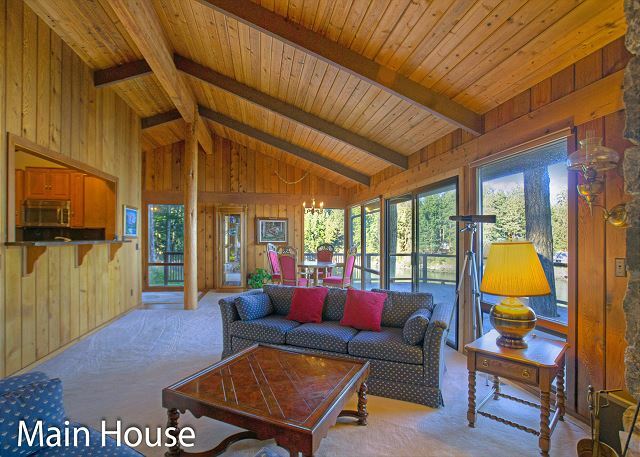 3 houses give some privacy, but with large porch and living room gathering space in main house. And view is beautiful out front. Highly recommend for 10-14 sized groups. The 3 homes clustered together worked well for our 4 families that came together from all over the US for a week's vacation. The main house with expansive deck (amazing water views) and multiple living spaces (spacious great room and dining area with water views, plus separate yet good-sized den)housed one family but also served as a terrific gathering spot for all; the other 2 houses provided the remaining families w their own sleeping spaces/baths/kitchens. 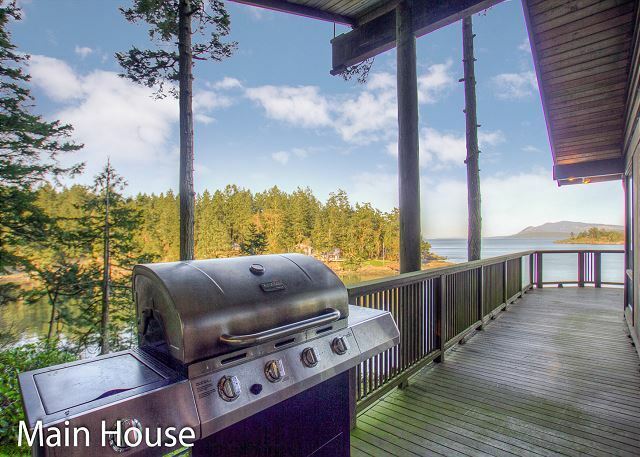 We loved the location,loved the views,appreciated the laundry rooms! Helpful advice: we recommend that renters drive an SUV, if possible, as the access road to the property gets a little steep, and by the time you've loaded people and luggage into your vehicle it helps to have the extra undercarriage clearance. Overall-Channel View Estate was a very comfortable venue for our group, and a solid value. We chose well! Family of 10 enjoyed the channel views, wildlife visits of deer, bald eagles and seals ! We never did see an otter but enjoyed looking. Well stocked amenities and wonderful continuous contact before and during from management company . Wouldn't hesitate to work with them again. Seamless get in and out. Perhaps the Mate's house could use some updating but overall the three families happy with the houses. After one orcaless whale watch we utilized the promised rain check and were treated to a pod viewing that exceeded all expectations! Wonderful property. Highly recommend. 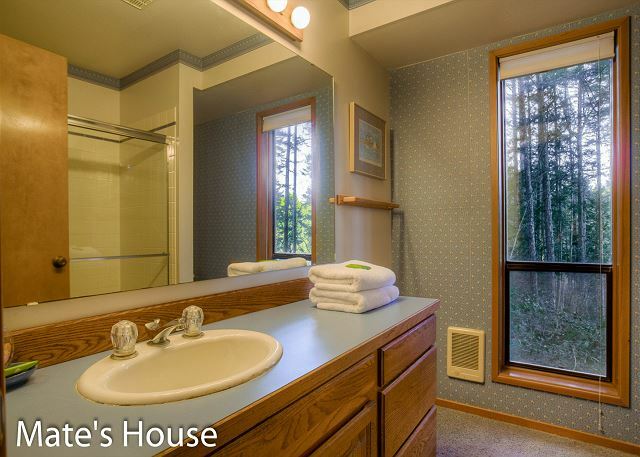 Fully stocked with paper towels, toilet paper, hand soap, etc. Loved our stay at the Channel View Estate! The views are gorgeous even when there aren't whales and harbor seals saying hi from the water, and the houses had everything we needed! The stunning views, peaceful location and comfortable accommodations made for the most perfect place for our cozy meditation retreat. 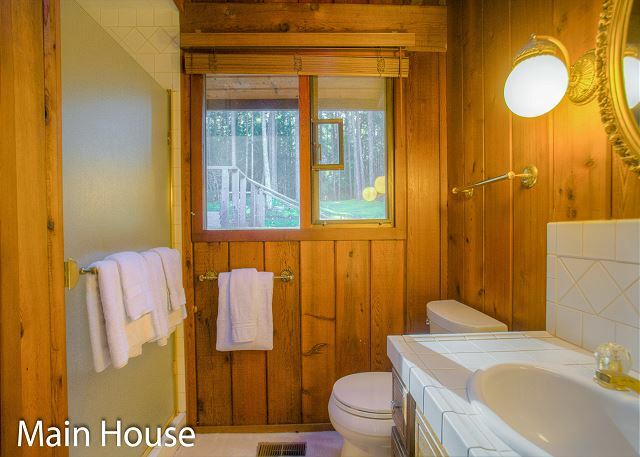 I was so relieved as I found the place matched the property description very well. We hiked up Young Hill, Picnicked at Lime Kiln Park, Paddle boarded with SpringTide Paddle Sports and enjoyed a sunset kayak tour from Crystal Seas. We will be back! The view was magnificent! We had a great time on the island and loved having our own space. We look forward to going back some day. 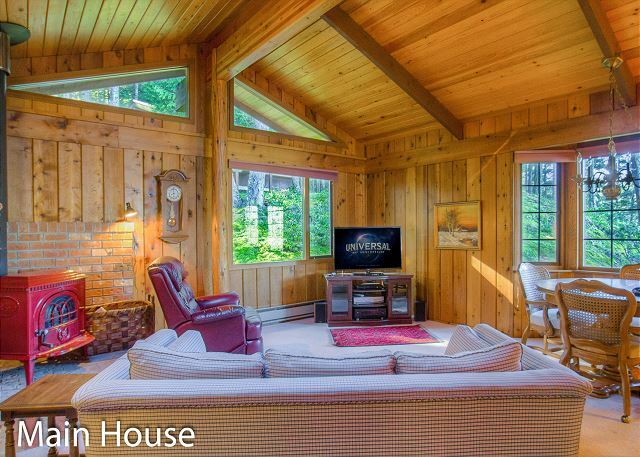 a grand time on a wonderful, well equipped three home property. The door screen flapping in the breeze, the backward faucets nor the cables laying on the ground did little to upset the tranquility of our happy time. We loved it all. Forest & ocean, spectacular views! Can't wait to go back! Excellent and terrific service. This was a perfect layout to accommodate our family. Beautiful views in a camp like setting. The property was great. I would definitely recommend the place to a friend or relative. It was clean which is very important to me. In the main house the side door (room w/fireplace) does not seem to close securely. I locked the screen instead. The skylight in the kitchen is leaking quite a bit. The light, in the toilet area between the room with the tub and the room with the shower, does not work. Excellent property. We recently stayed with 2 of our 3 sons and 3 grandchildren. It was a beautiful and peaceful family vacation. 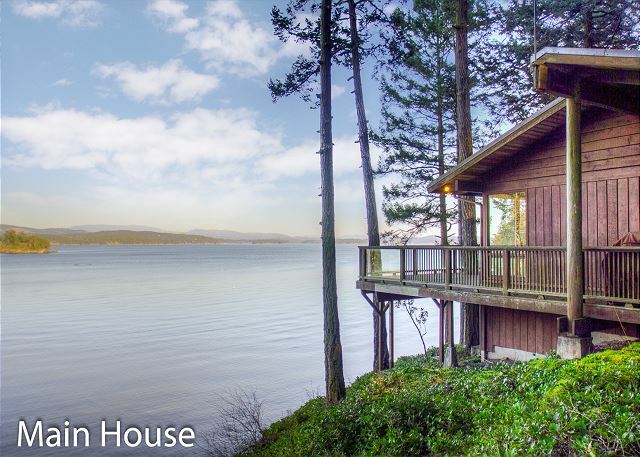 The house was in a great location with a beautiful view. It is perfect for several families traveling together.